There was no doubt when I started at Chapel Street Precinct Association (CSPA) three months ago I had my work cut out for me; we had to put the street back on the map, and quickly! National attention was the aspiration, but with a bare-bones budget, it had to be catchy, clever and just a little bit controversial. The idea germinated after John Lotton (our CSPA President) and I had a night out in Kings Cross; this once colourful, vivacious, thriving epicentre of activity at any time of the day or night had become what I can only describe as a desolate location with tumble weeds! It was in that moment of overwhelming disappointment the idea of our guerrilla campaign came to us. Convincing the people of Sydney to fly to Melbourne because their city’s nightlife was suffering an agonising death at the hands of its own State Premier was going to be tough. Guerrilla marketing is not safe marketing – there is no creativity in safe and certainly no change. While everyone is ‘grabbing the bull by the horns,’ we at Chapel St decided to ‘grab the bull by the balls’ and be unapologetically bold in our approach. John Lotton and I put a body of ideas together that poked fun at Sydney’s ailing nightlife in a way that didn’t get Sydneysiders offside. 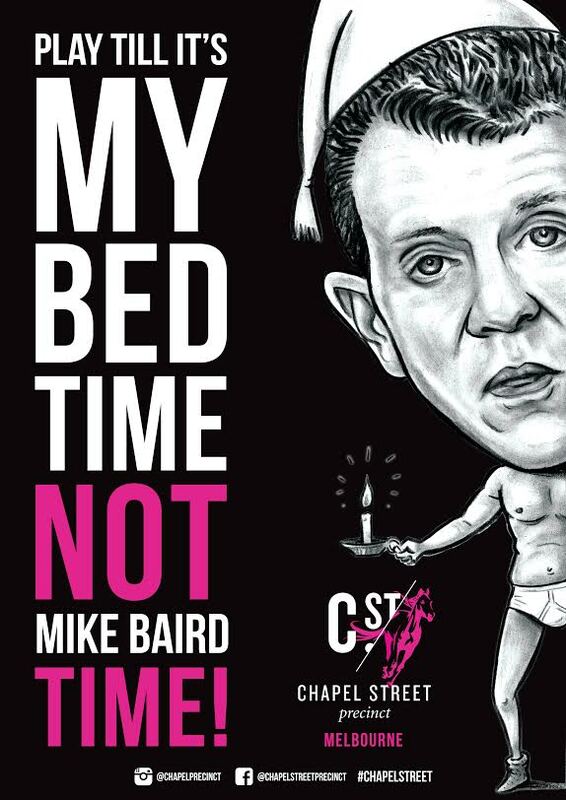 One line stood out and we knew it was the launching point for all of the creative: ‘Play till it’s MY bedtime, not Mike Baird time!’ was born. The combination of the social swell and a targeted above-the-line campaign featuring rock posters and Adshels, made the campaign a heated talking point across Sydney, and a thorn in the side of the Premier; that’s when PR practitioner and friend Drew Lambert of DL COMMS came knocking. Seeing the campaign come to life on his social media, Drew suggested our marketing campaign could attract genuine interest from news media. With his guidance, our campaign was being discussed on news.com.au, The Daily Telegraph, The Herald Sun, The Sydney Morning Herald, The Today Show as well as several major metro radio interviews. Chatter has continued to snowball across social media channels of Facebook, Instagram, Twitter, Snapchat even as I type this. It really was a marketing executive’s dream come true! Overall, we took a lot of risks with the campaign but we believed in the cleverness of the message and that’s what gave us the confidence to push through. Plus our gut always told us it would be a success. It’s a new and exciting time for the Chapel Street brand and with increased competition from retailers in the city and outer-suburban mega malls, the timing couldn’t have been better to inject some cheeky personality to set our precinct apart. No one can say we are vanilla, that’s for sure! Chrissy, was the buzz around the campaign centered in Sydney, or did it spill over to the ever-present locals in Melbourne? Hi Darryl, thank you for your question. We were so proud to have the buzz/or exposure go national… & just this week internationally! We have also had thousands of Victorians share our poster artwork via socials to their Sydney mates, which we of course loved! The trouble is, your description of Kings Cross as a ‘once colourful, vivacious, thriving epicentre of activity at any time of the day or night’ is so very far from the truth. To walk through Kings Cross at 2am on a Saturday night and see it as described would have required at least 15-20 drinks under the belt. And some drugs. Or perhaps just a vested interest in making as much money as possible out of the revellers visiting the area. Kings Cross was a the epicentre of violence and antisocial behaviour in Sydney. A 2010 City of Sydney report recorded 80 incidents of antisocial behaviour across just one hour in one location in the Cross on a Friday night. So, your campaign may have grabbed some headlines by being provocative, but it wasn’t by being honest. If you’re suggesting Chapel Street is like Kings Cross before the lockout laws, then I feel sorry for the people (and particularly the doctors and emergency service workers) of Melbourne. In response to “The Facts” comments, I’d firstly like to point out that Sydney’s lock out laws effect an area far broader than the heart of Kings Cross. Our campaign highlights the substantial difference in the nightlife and liveability between Australia’s two largest cities, and the inner city environment of both. Chapel Street has a thriving, friendly, and in the most part, very safe nightlife. Sydney does not, and that was confirmed last Sunday by the 10,000 protesters at the Keep Sydney Open rally. Our campaign is about inviting responsible adults living in Sydney, who are sick of the very restrictive lock out laws, to come to Melbourne and experience a thriving nightlife once more. And in that, we are being very, very honest. Wouldn’t a campaign centred at bringing Melburnians back to Chapel St have been more effective at actually increasing visitors to the area rather than making headlines in Sydney? Congratulations on the marketing campaign of the year. You guys seem to be everywhere in the last few weeks. No doubt this has set a new bench mark for the industry and other marketing teams. Well no one else would be bold enough to do a marketing roll out like this. Well done on doing something different.